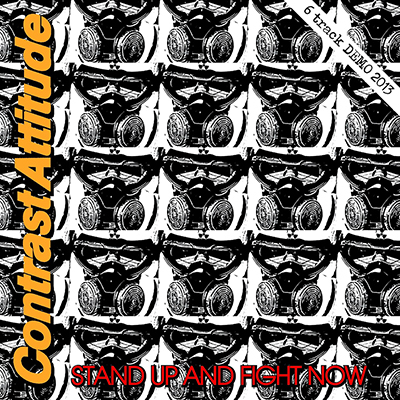 , they were formed in the year 1998 and very well-known for their aggressive, chainsaw-like, distorted Raw Punk, Noise Punk sound that seeks influences from other acts like DISCLOSE, DISCHARGE, FRAMTID, ... . "Stand Up And Fight Now" is the bands´ demo EP 2013 and offers six songs of their "trademarked" brutal sound. The first pressing was done in the year 2013 on KONTON CRASHER, USA. Repress for the CONTRAST ATTITUDE "Relentless Assault" West Coast Tour 2018, 400 copies on Black vinyl housed in an EP pocket cover that comes with insert and sticker.